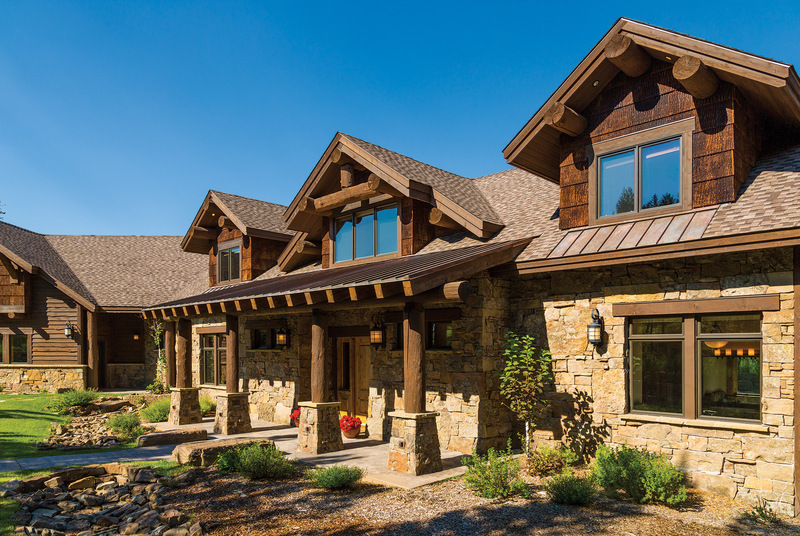 THE BIG SKY, MONTANA, VACATION HOME of Candy and Donn Fuller began as a fabled sketch by Donn, progressed with a call to builder Cooper Wade, of Wade and Associates Builders Inc., then came into form under direction of architect Dave Seabury, of Seabury Design Associates P.C. in Bozeman. 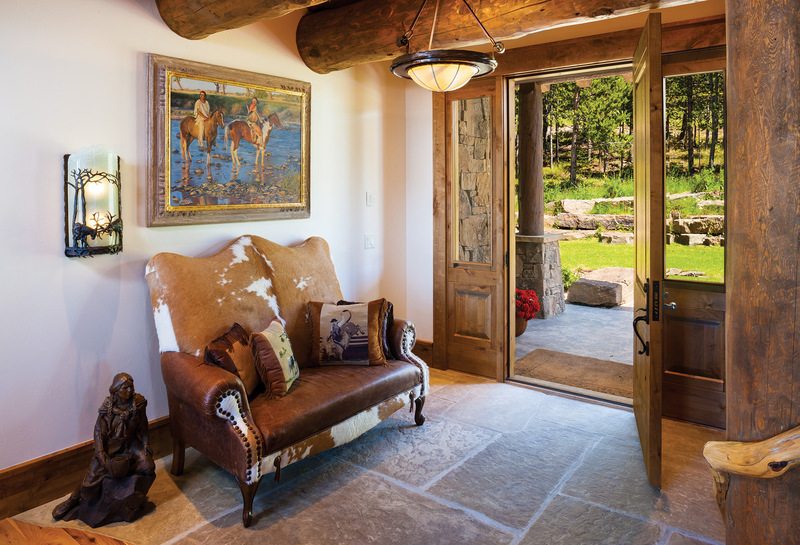 The result: a 7,300-square-foot log and stone lodge where the Fullers host friends and family. 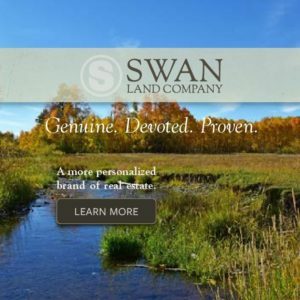 They purchased the property after snowshoeing to it one wintry day a few years ago. “At 7,998 feet in elevation you really see the peaks,” says Donn Fuller of the view of Lone Mountain, Fann Mountain and both Big Sky and Moonlight Basin ski areas. An orthopedic surgeon in Florida, Fuller is a lifelong skier, so skiing is the house’s raison d’être. Given its purpose, and the fact that in winter the front door is snowed-in by six-foot-tall drifts and thus thoroughly inaccessible, the best way to approach the home is on skis or through the double garage. Imagine, for the sake of a tour, skiing powder all day, then “commuting” back to Cascade Subdivision via a series of chairlifts. As you ski to the house you pass a bronze by Prescott, Ariz., artist John Coleman entitled The Rainmaker. The larger than life sculpture depicts a Native American shooting an arrow at the sky. One could easily imagine his arrow bringing snow rather than rain. Click out of your bindings next to a double diamond experts only sign nailed to a log column, store your equipment in the ski room that resembles a miniature ski shop, then warm your bones in the sauna directly across the hall. Afterwards, walk down the hallway to the recreation room, past the bunk room, with two bombproof double bunks. The bunks, like all the bedroom furniture and cabinetry in the home’s three guest bedrooms, master bedroom, and multiple bathrooms, were designed by Donn Fuller and built by Wade and his colleagues. Enter the perfect après ski lounge. A stone fireplace and flat screen television are on opposite walls. A line of windows and a door to the lawn form the third, and a well-stocked nook bar forms the back wall. Adjoining this room are a walk-in wine cellar and the master guest bedroom. Now sated by your sauna, cocktail and time in front of the fire, head upstairs to the main floor. 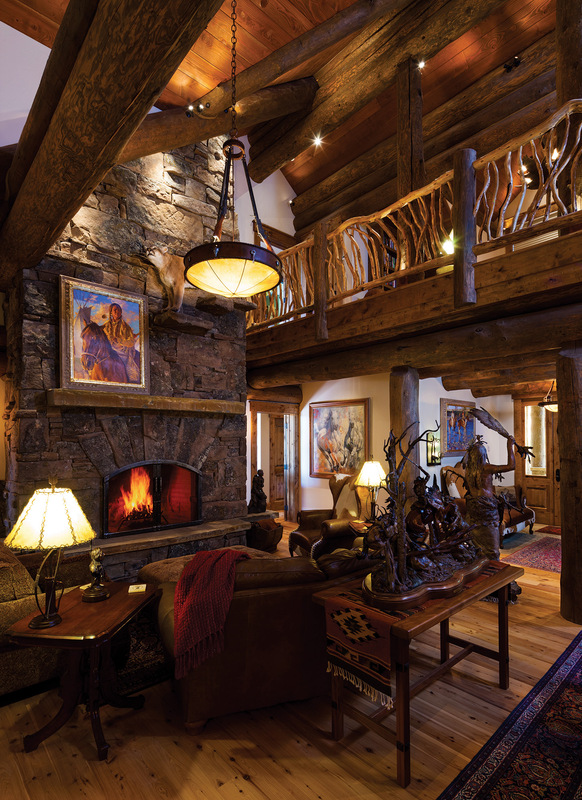 The staircase, a wood whimsy with railings of twisted pine and half-log stair treads, is reminiscent of the Old Faithful Inn in Yellowstone National Park and evidence of both the Fuller’s imagination and the builders’ craftsmanship. The home’s main floor is the middle story. Here, during the summer, you would enter through the front door into the great room. This central gathering place has a vaulted ceiling and a wall of windows. A wood-burning fireplace with a 19-foot-tall stone chimney anchors the room. Down it descends a taxidermied cougar. The master bedroom and bath are adjoining. 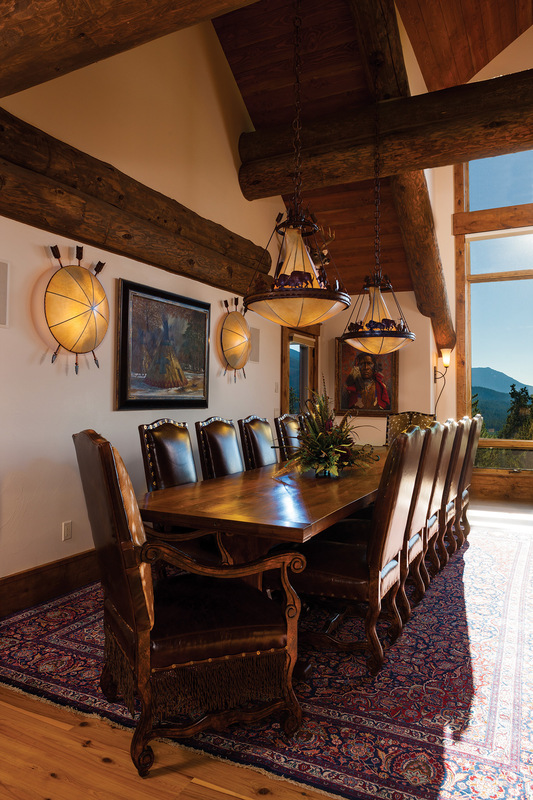 Above the dining table in the great room are iron and rawhide chandeliers made by Fire Mountain Forge of Livingston, Montana. Like all the lighting and plumbing fixtures, the stone countertops were selected by Candy Fuller. Artwork is everywhere. The theme is Western. 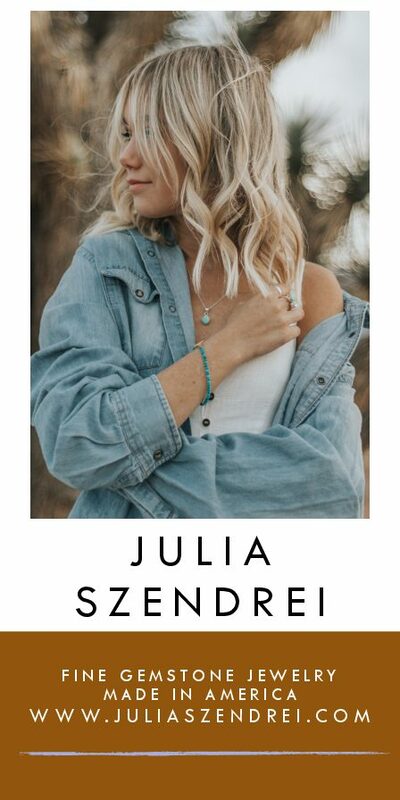 Paintings, prints and sculptures of Native Americans, mountain men and cowboys abound, so too do Native American-inspired pieces built of antler, hide, beads and feathers that resemble tribal medicine artifacts. The open staircase continues from the great room to a third floor landing where there is a cozy reading area. On either end is a guest bedroom. The heart of the home is the kitchen, which adjoins at the great room’s east end. It is large (450 square feet) and contains two Wolf ovens, above which Seabury and Wade created a high-tech, in-ceiling ventilation system hidden between log beams, so Fuller can cook his famous lamb chops without concern. Red dragon granite countertops compliment the dark wood kitchen cabinetry and provide ample space to prepare meals. If spectating is your style, you can sit in the breakfast nook with wrap-around windows and watch Fuller cook. 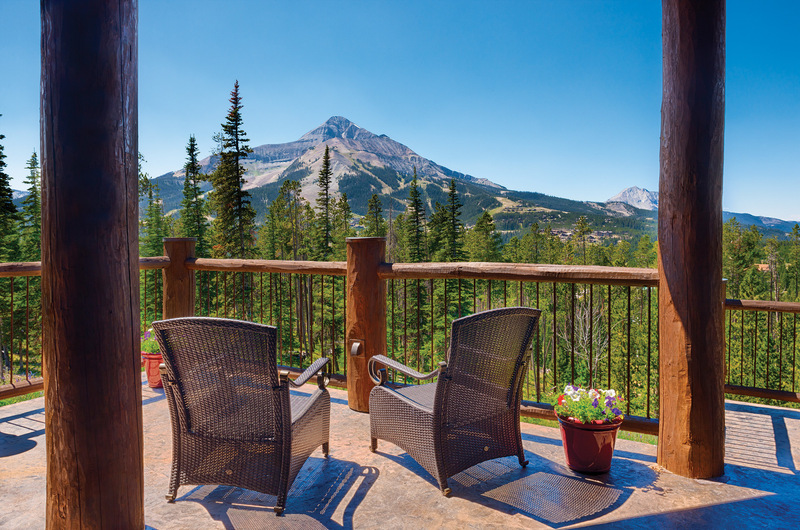 A few steps up from the kitchen, the nook has the best views of Lone Mountain. Beyond the nook is a hallway to the garage and a door that leads to a stamped concrete patio with a stone fireplace. Here, the Fullers barbecue in the summer with convenient access to the lawn and the wraparound second-story deck. 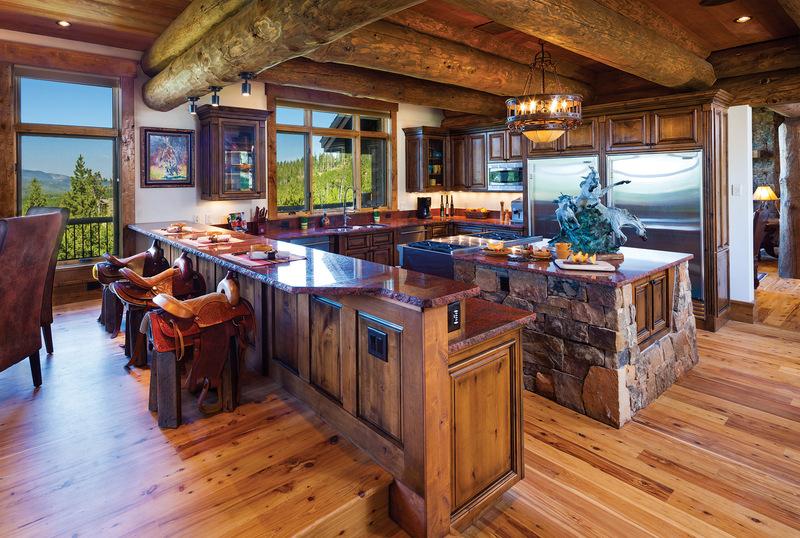 The Fuller home is designed as a ski-in and ski-out lodge, but with its efficient design of three-stories built into the grade of the mountain, it is also the perfect summer retreat because of the outdoor lifestyle it facilitates. The Fullers are, in fact, already looking forward to hosting their three little cowboy grandsons for the Fourth of July. Cocktail hour under the big sky is best on the concrete second-story deck. The home’s front has timber framing, a shed roof of copper, Montana moss rock, and poplar bark siding. Mount a western saddle and watch the cooking magic happen. 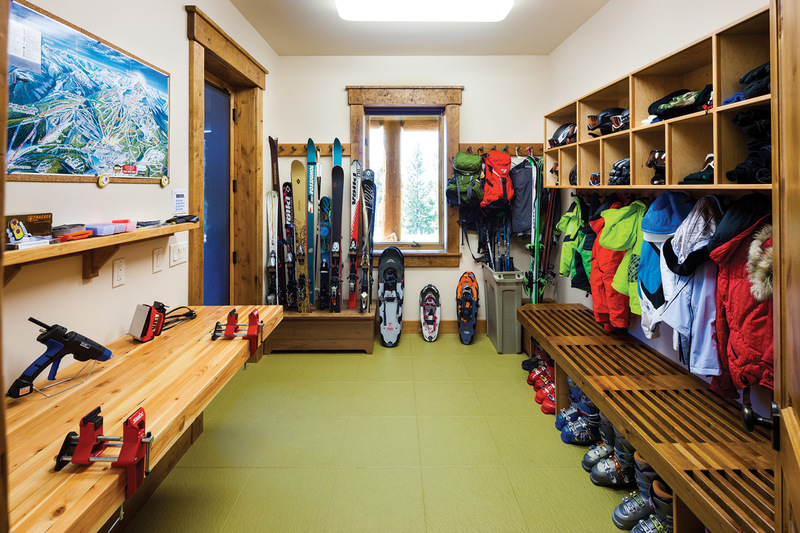 Tune your skis then hit the slopes from the ground-floor ski room. The Fuller home entryway is warm and welcoming. The dining room table built by Ron Hart Woodworking is fit for a feast. 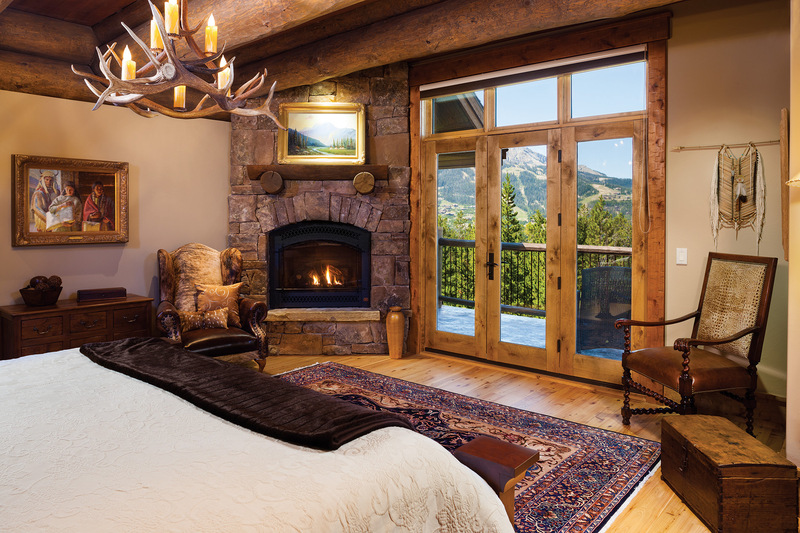 A gas fireplace warms the master bedroom that looks toward Lone Peak. 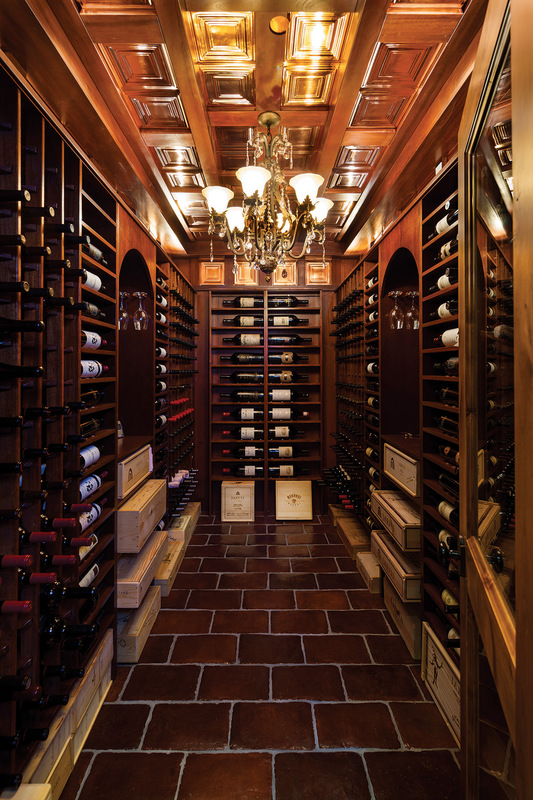 The walk-in wine cellar has a copper ceiling and wine racks designed by Donn Fuller. The living room reflects the Fuller’s park architecture aesthetic with round log beams, organic branched railing and stacked stone fireplace. In the master bathroom, the tub with a view is rocklined like a mountain hot spring.